In the mid-1950s, the USAF required a jet trainer with higher performance than the T-33 to better prepare student pilots for the latest tactical aircraft that were then coming into service. The aircraft chosen was the T-38A which offered high performance with low maintenance and operating costs. The T-38A became the USAF's first supersonic trainer. The T-38A prototype first flew on 10 April, 1959, and production continued until 1972. A total of 1,189 T-38As were built. Some were later modified into AT-38Bs with external armament for weapons training purposes. Jacqueline Cochran set eight performance records in the fall of 1961 flying a production T-38A and in February 1962 a T-38A set four international time-to-climb records. 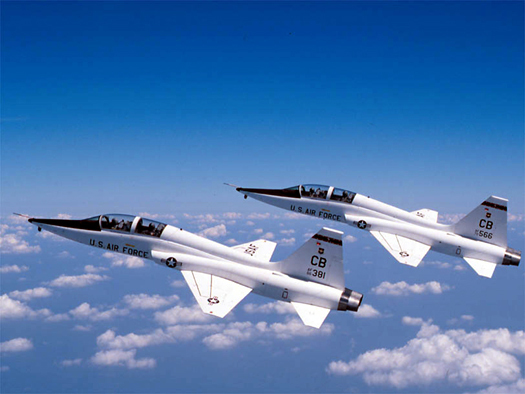 The USAF Thunderbirds used T-38As from 1974 to 1982 because of their economic operation and high performance. Other users of the T-38A include the U.S. Navy in their Top Gun combat simulation program and the National Aeronautics and Space Administration (NASA).